Cute, Crafty Things: Monsters in the House! Dreamed up by Miggy at This Little Miggy Stayed Home, this crafty project is ridiculously simple and well...the results speak for themselves. Miggy stamped on the feather pattern using a sweet potato and some fabric paint! 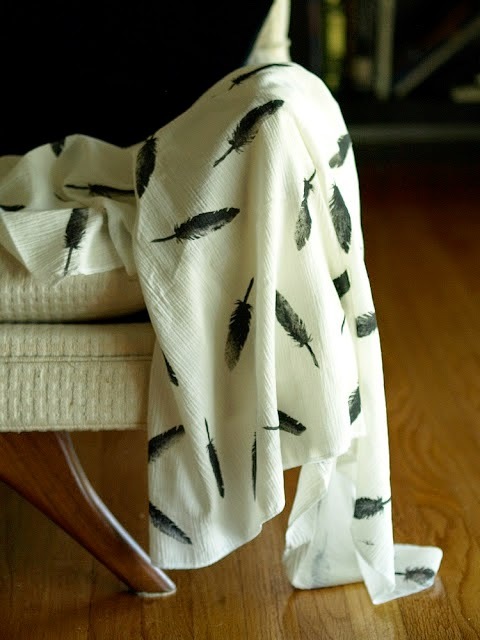 Even if you don't have any need for a swaddling blanket, this technique could be used to do up some gorgeous light weight scarves or gauzy curtains. Your projects are only limited by your imagination (...and sweet potato carving skills)!